This is one of my favorite recipes. 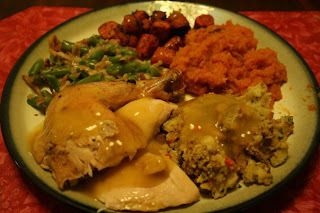 Not only does it turn out excellent, it is a great example of a really easy recipe that looks like you've slaved over it for hours when it's done. It's a combination of techniques I've learned from a cookbook I received for my wedding and recipes I've read online. Remove the bag from the cavity of the chicken. Rinse the chicken inside and out, pat dry, and salt and pepper the cavity. Insert lemon quarters (2 will probably be all you can fit) and 2-3 sprigs of rosemary. Place in a 9x13 casserole dish. Baste all over with olive oil. A basting brush works best. Salt and pepper the skin lightly. This will help create the golden glowing skin. Combine all of the veggies, garlic, and more salt and pepper to taste in a bowl with olive oil and coat thoroughly. Place these around the chicken in the casserole dish. Place in oven and bake for 45 minutes. 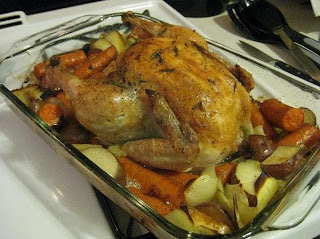 Take the dish out of the oven and tip the chicken so the juices run out, then rebaste with the juices. Put back in the oven for another 35 minutes. When complete, take the chicken out and let sit for 5-10 minutes before cutting. Enjoy with the veggies and any other sides you might like!